Reference number for this case: 21-Oct-54-Guînes. Thank you for including this reference number in any correspondence with me regarding this case. 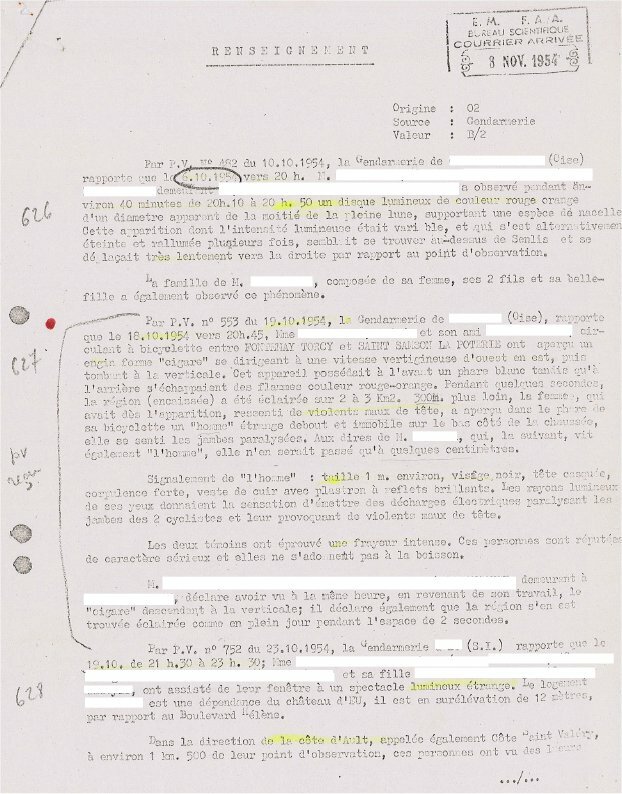 A memo of the National Gendarmerie of a brigade in the Pas-de-Calais, of October 23, 1954, reports an observation of October 21, 1954, at 19:30 by a Maréchal des Logis Chef and a Gendarme of the brigade, who observed a luminous phenomenon as they circulated between Andres and Guînes on the GC No. 224. The two military men were going towards Guînes, they were going to reach the railway of local interest (Lambert coordinates: x = 568.800 - y = 351.900). The darkness was total, the sky very clear, the stars visible, the wind almost nil. They saw a very bright light trail crossing the sky at low altitude and at a very high speed in a north-south direction. The trail was compared to the luminous wake that could be left by a rocket, and possibly "coming from a craft that remained invisible." It had the shape of a cone of "length ranging from 200 to 300 meters and a diameter of 2 to 10 meters, the tip of the cone directed in the direction of travel, the base of the cone extended by a multitude of sparks." It is said that the altitude of the phenomenon, "rather difficult to determine, can nevertheless be between 400 and 500 meters." There was no noise related to the trail; which was visible for some 15 seconds. The note ensured that the phenomenon "cannot be classified among known phenomena, such as shooting stars or meteors because of the importance of its dimensions and the horizontality of its trajectory, nor be emitted by a known apparatus or craft, rocket or airplane, given its speed." The note was anonymized and published on the Web by GEIPAN around 2014: they rightly explained the sighting as a probable meteor. about a luminous phenomenon observed by the Maréchal des Logis Chef [blackened out], commander of the [blackened out] squad and the Gendarme [blackened out] of the same squad. 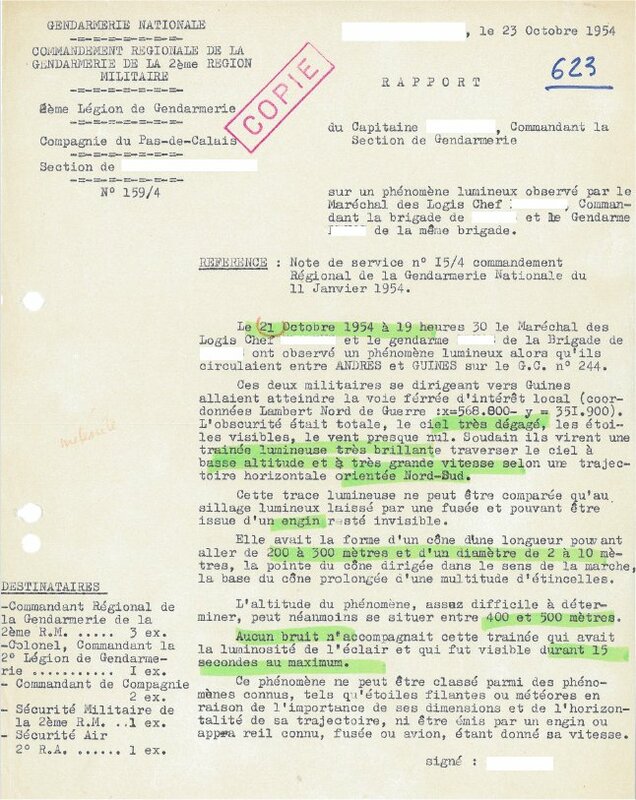 REFERENCE: Service memo # 15/4 Régional command of the National Gendarmerie for January 11, 1954. On October 21, 1954 at 7:30 p.m. the Maréchal des Logis Chef [blackened out] and the gendarme [blackened out] of the Brigade of [blackened out] observed a luminous phenomenon while they circulated between ANDRES and GUINES on G.C. # 224. These two soldiers heading towards Guines were to reach the railway of local interest (coordinates Lambert North of War: x = 568,800-y = 351,900). The darkness was total, the sky very clear, the stars visible, the wind almost nil. Suddenly they saw a very brilliant luminous trail crossing the sky at low altitude and at very high speed along a north-south trajectory. This luminous trace can only be compared to the luminous wake which can be left by a rocket and which can come from a machine that had remained invisible. It had the shape of a cone with a length of 200 to 300 meters and a diameter of 2 to 10 meters, the point of the cone directed in the direction of travel, the base of the cone extended by a multitude of sparks. The altitude of the phenomenon, though difficult to determine, can nevertheless be between 400 and 500 meters. No noise accompanied this trail which had the luminosity of lightning flash and which was visible for 15 seconds at most. This phenomenon cannot be classified among known phenomena, such as shooting stars or meteors because of the size of its dimensions and the horizontality of its trajectory, nor can it be emitted by a known craft or apparatus, rocket or airplane, given its speed. 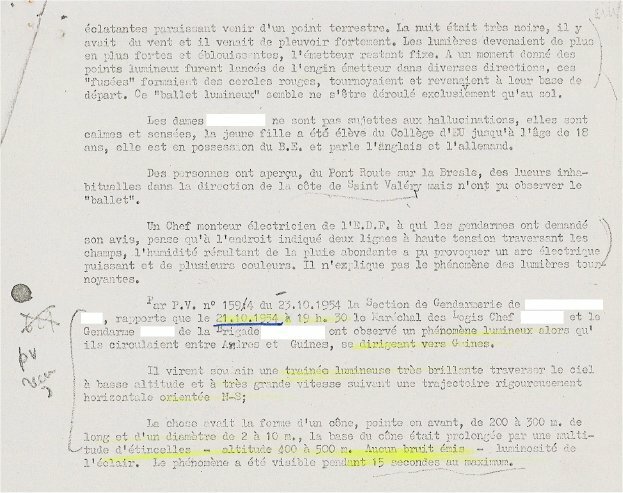 By P. V. ["Procès Verbal", written report] No. 482 of 10.10.1954, the Gendarmerie of [Blackened out] (Oise) reported that on 6.10.1954 around 8 p.m. Mr. [Blackened out] residing [Blackened out] observed for about 40 minutes from 8:10 pm to 8:00 p.m. to 8:50 p.m. a luminous disc of orange red color with an apparent diameter of half the full moon, supporting a kind of nacelle. This apparition, whose luminous intensity was variable, and which was alternately extinguished and relighted several times, seemed to be above Senlis, and moved very slowly to the right in relation to the point of observation. The family of Mr. [Blackened out], composed of his wife, his 2 sons and his daughter-in-law, also observed this phenomenon. By P. V. No. 553 of 19.10.1954, the Gendarmerie of [Blackened out] (Oise) reported that on 18.10.1954 Mrs [Blackened out] and her friend [Blackened out] riding a bicycle between FONTENAY TORCY and SAINT SAMSON LA POTERIE saw a gear shaped as a "cigar" going at a prodigious speed from west to east, then falling vertically. This craft had a white headlight at the front, while orange-red flames arose at the rear. For a few seconds, the area (in a hollow) was illuminated on 2 to 3 square kilometers. 300 meters farther away, the woman, who had felt severe headaches from the moment she saw in the headlight of her bicycle a strange "man" standing motionless on the side of the road, she felt her legs paralyzed. According to Mr. [Blackened out], who followed her, and also saw the "man", she passed only at few centimeters of the "man". Description of the "man": size 1m. approximately, black face, helmeted head, strong corpulence, leather jacket with brilliant highlights. The light rays of his eyes gave the sensation of emitting electric shocks paralyzing the legs of the 2 cyclists and causing them violent headaches. The two witnesses experienced intense fright. These people are reputed to be of a serious nature and do not indulge in drinking. Mr. [Blackened out], residing at [Blackened out], stated that at the same time, on his return from work, he had seen the "cigar" descending vertically; he also declared that the region had been lit up like in broad daylight for 2 seconds. By P. V. No. 752 of 23.10.1954, the Gendarmerie [Blackened out] (S.I.) reports that on 19.10, from 9.30 p.m. to 11:30 p.m. Mrs. [Blackened out] and her daughter [Blackened out], observed from their window a strange luminous display. The [Blackened out] housing is a dependence of the castle of EU, it is in elevation of 12 meters with respect to the Boulevard Hélène. seeming to come from a terrestrial point. The night was very dark, there was wind and it had rained heavily. The lights became stronger and stronger and dazzling, the source remaining fixed. At one point luminous spots were launched from the source in various directions, these "flares" formed red circles, spinning and returning to their starting base. This "luminous ballet" seems to have taken place exclusively on the ground. The ladies are not subject to hallucinations, they are calm and sensible, the girl was raised at the College of EU until the age of 18, she is in possession of the B.E. [Brevet d'Etudes] and speaks English and German. From the road bridge over the Bresle, people saw unusual lights in the direction of the Côte de Saint Valéry but could not observe the "ballet". A chief electrician of the E.D.F. to whom the gendarmes asked for his opinion, thinks that at the indicated places two high voltage power lines are crossing in the fields, the humidity resulting from the heavy rain could cause a powerful electric arc and several colors. He does not explain the phenomenon of revolving lights. By P.V. n° 159/4 of 23.10.1954 the Section of Gendarmerie of [Blackened out], reports that the 21.10.154 at 07:30 p.m., the Maréchal des Logis Chef [Blackened out] and the Gendarme [Blackened out] of the Brigade of [Blackened out] observed a luminous phenomenon as they circulated between Andres and Guines, heading towards Guines. They saw a very bright luminous trail crossing the sky at low altitude and at very high speed following a strictly horizontal trajectory oriented N-S. The thing had the shape of a cone, point forward, from 200 to 300 m. long and with a diameter of 2 to 10 m., the base of the cone being prolonged by a multitude of sparks - altitude 400 to 500 m. No noise emitted - brightness of lightning bolts. The phenomenon was visible for 15 seconds at most. Luc Chastan indicates that in the Pas de Calais at Guînes on October 21, 1954, at 19:30 "Two witnesses gendarmes being on secondary road 244, observed by clear sky an object in the shape of a cone of a size estimated as 10 meters. It was luminous and moved in straight line without any noise and very fast while leaving a luminous trail. The observation lasted less than one minute and the distance estimated between the witnesses and the object was lower than a thousand meters." Luc Chastan indicates that the source is "Les Universons par Poher Claude ** http://www.premiumwanadoo.com/universons/"
Summary: Observations of the silent passing N-S of a luminous trail in the sky: probable observation of the passage of a fireball. On October 21, 1954 at 7:30 p.m., two gendarmes observed for a maximum of 15 seconds a very brilliant luminous trail that silently crosses the sky at high speed in a north-south direction. In the dark night with clear skies and visible stars, this trail has the shape of a cone with the tip forward and the base extended by numerous sparks. Its trajectory is horizontal. Although the witnesses (wrongly) excluded a meteor "because of its size and the horizontality of its trajectory" it is probably what they saw. GEIPAN classifies this case B as a probable observation of the passage of a bolide caused by the re-entry into the atmosphere of a natural meteoroid that fragmented. Hour of the observation Numbered: 6 p.m. - 8 p.m.
Rather obvious description of a meteor. [gn1] Report by the Gendarmerie Nationale, Compagny of the Pas-de-Calais, October 23, 1954, published by the GEIPAN in 2014. [gn2] Information sheet by the Gendarmerie Nationale, November? 1954, published by the GEIPAN in 2014. 1.1 Patrick Gross January 21, 2017 Additions [gn1], [gn2], [ge1], [ub1]. Change of city name from "Guine" to "Guînes". 1.2 Patrick Gross January 3, 2019 Addition of the Summary.